Joseph Bermudez, military analyst for Jane’s Intelligence Review and author of The Armed Forces of North Korea, has published the ninth issue of his very fascinating KPA Journal. Click here to download the full issue (PDF). You can find all of the previous issues of KPA Journal here. This entry was posted on Tuesday, October 5th, 2010 at 4:23 pm and is filed under Military. You can follow any responses to this entry through the RSS 2.0 feed. Both comments and pings are currently closed. I always like the KPA Journal. 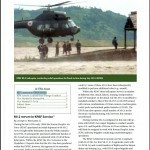 Interesting picture of the Mi-2 on the front cover. Is it just me, or does it seem “odd”? On the one hand, it could look like the rear landing wheel is touching that pile of dirt, in the background. On the other hand, the Mi-2 is probably in the foreground, the same distance away as the crowd of people, maybe? But on the third hand, if it is above the crowd, why is no one ducking? Did JB talk about propaganda photos in the article?